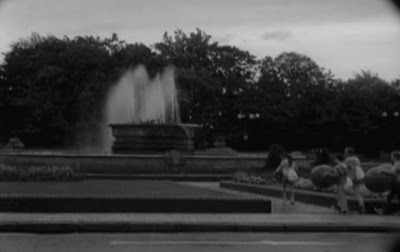 Kings of England’s In Eldersfield, Chapter Two: Monument to Charlie Chaplin is a short 16mm black and white film made by Rosie Carr with music by Nick Gill. In the same way that Michael Craig-Martin’s An Oak Tree is a glass of water. Or, to put it another way, the film is the monument. As a film, it plays with the idea of its monumentality. It is also a documentary of a performance, but the performance exists solely for the camera. Although the fact that the performance took place in reality is also significant. Kings of England is an umbrella term for projects convened by Simon Bowes (here working with John Pinder (co-concept development and co-direction with Bowes), Rhiannon Armstrong (interviews, field recordings and violin), Alex Eisenberg (documentation, website and print)). In Eldersfield is a project – he explained, introducing the piece – which is taking place over the course of a decade and will consist of ten Chapters. A decade is not necessarily a length of time, he added. Eldersfield is a made-up name for a place that is about history, ancestry, and the project is about commemorating and reclaiming items from the 20th Century. Chapter One – described beautifully here by Matt Trueman – was a live performance concerning the theoretical physicist Paul Dirac, and a twenty minute silence he once took before replying to a question he had been asked. Chapter Two is nominally about Charlie Chaplin. The monument, however, is as much to the National Picture Theatre in Hull (a strikingly resonant title for a cinema, particularly in these days after NT50). On 18 March, 1941, it was bombed while 150 people were inside watching Chaplin’s film The Great Dictator. Miraculously, no one was injured, but the building still stands empty and ruined on Beverley Road and is about to be knocked down. Monument, then, preserves these facts, and captures images of the building. On top of that it creates an abstract performance and evocation of them. To this end, the film follows five children/young people (10-14) from them brushing their teeth and eating breakfast to a point where they are gathered in the studio theatre in the Hull Truck building. But, Kings of England have created a rather profoundly brilliant sort of local patriotism against nationalism: warmth, but also self-criticism. 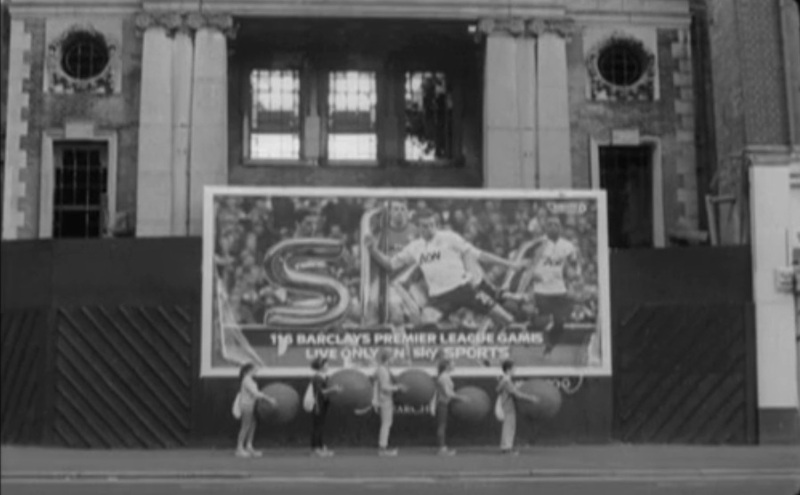 The film looks a lot like a 1940s newsreel, or the sort of archive footage we see of new towns in the 1930s or 1950s. This is partially supported by fact the houses in which most of the children are introduced were built in this period, but there’s something more about the film stock that makes it look like it’s vintage even while they’re fastening velcro trainers and adjusting their smart phone. These images in particular feel incredibly astutely picked. We at once have this sense of “our reality”, the here-and-now, but at the same time a very familiar aesthetic of “heritage”. What the children are bringing to the film, beyond some useful and necessary movement, is an abstracted-to-the-nth degree, almost cubist rendering of that scene from The Great Dictator in which Chaplin-as-not-actually-Adolf bounces that large inflatable globe around to the prelude from Lohengrin (which is effectively just the instrumental version of In Fernem Land, which I first happened to see in Meine Faire Dame). And that is part of the wider genius of this short film. It takes, plays with, and interrogates even these most problematic aspects of monumentalism, goes close to an artistic edge by deploying such strong symbolism as Wagner and Hitler, while concurrently offering a comment on the monumentalism of capitalism (the film cleverly tracks the children both marching through a park, past an old Victorian statue, past a town centre war memorial, and then through a shopping mall with a massive Tesco that might as well have been designed by Albert Speer), treading an intricate, intelligent path between reactionary yearning for The Good Old Days™ and palpable disgust at the corporatisation of Britain. In the best possible way, it has its cake and eats it. As a work of art, I’d say it is one of the most intelligently critical, searching pieces I have seen this year, or in a long while, actually. I have no idea how anyone else will get to see it, but I hope conditions exist to enable a far wider constituency than Monday’s invited audience to experience this work.